Death from cervical cancer is preventable with vaccination, screening, and treatment. Cervical cancer is the 4th most common cancer in women worldwide and the primary cause of cancer-related deaths among women in low- and middle-income countries (LMICs). Virtually all cases of cervical cancer are caused by human papillomavirus (HPV) infection, the most common viral infection of the reproductive system, and it infects most sexually active men and women in their lifetimes. HPV infection can be prevented when girls and boys are vaccinated against the virus. Cervical cancer can also be easily prevented through screening of women and treatment of precancerous lesions. Nearly 85 percent of cases and 90 percent of deaths from cervical cancer occur in LMICs. Cervical cancer is a major cause of disability and death for women in their 30s and 40s, depriving families of mothers, caretakers and income. It pushes families into poverty and robs communities of their most productive human resources. 1. American Cancer Society. Global Cancer Facts & Figures 3rd Edition. Atlanta: American Cancer Society; 2015. The ACS CAN report, ‘Saving Women’s Lives: Accelerating Action to Eliminate Cervical Cancer Globally’ examines the increased prevalence of cervical cancer in low and middle-income countries (LMICs) and calls on Congress to dedicate a portion of U.S. global funding to implement proven strategies to end deaths from this disease worldwide. 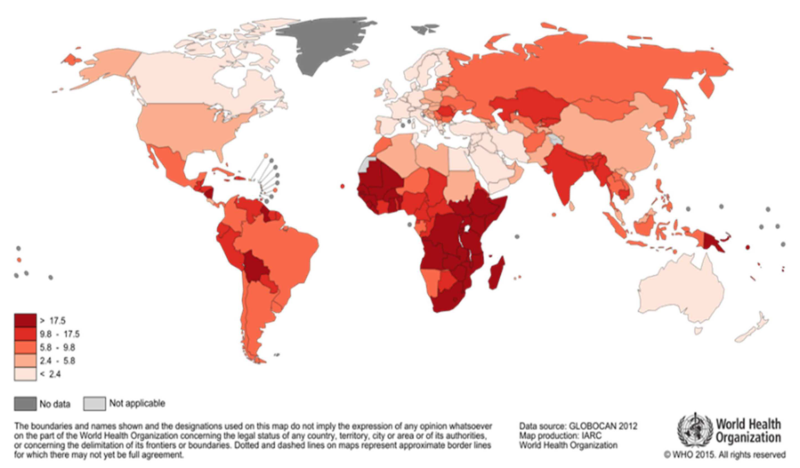 Ninety percent of all cervical cancer deaths occur in low- and middle-income countries. Cervical cancer is the leading cause of cancer deaths among women in 38 of these countries, mainly in sub-Saharan Africa. Testimony Submitted to the Senate Committee on Appropriations, Subcommittee on State, Foreign Operations, and Related Programs, for Fiscal Year 2018 in support of a proposed statutory proviso that would encourage the Department of State and the U.S. Agency for International Development (USAID) to take steps toward eliminating cervical cancer deaths worldwide.